How did attachment parenting originate? William and Martha Sears structured the practice of attachment parenting on what they call “The Baby Bs” and offer them to parents as “tools” to help them build lasting bonds with their children. The Baby Bs are listed in their book The Attachment Parenting Book. The basis for these tools came from observing and talking to the many parents in their practice who had great relationships with their children. API has, with their blessing and support, used the Baby Bs and expanded them to include additional information that we believe to be important. We have structured them into the eight principles of parenting to provide guidance for parents as they face serious decisions and cultural pressures on a daily basis. These principles were created through the lens of attachment research and are designed to help parents become more attuned and connected to their children. What is positive discipline, and why is it important? From the attachment parenting perspective, positive discipline embodies the “golden rule” of parenting; in other words, treat children the way you would want to be treated if you were the child. Positive discipline is an overarching concept based in the understanding that when a child is treated respectfully within loving, age-appropriate boundaries, he will develop a conscience guided by his own internal discipline and empathy for others. Positive discipline is rooted in a secure, trusting, and loving relationship between parent and child. With a strong foundation of trust, positive discipline incorporates empathic and respectful strategies that over time will strengthen the connection between parent and child, while harsh or overly punitive discipline weakens the connection. Using shame, humiliation, guilt, manipulation, coercion, or physical forms of discipline can interfere with the connection between parent and child. Physical forms of discipline have been shown to lead to an increased risk of future antisocial behavior, including crime and substance abuse. Children raised with the fear of being hurt learn to behave positively because they are in sight of their parents or another authority figure. They may fear punishment, or they may fear a loss of parental love and affection. Although physical discipline and fear may change behavior in the short term, it will not have the desired effects in the long term. At the heart of positive discipline is a secure attachment relationship with your child. Gordon Neufeld and Gabor Maté write in their book Hold On to Your Kids that “for purposes of childrearing, the crowning achievement of a working attachment is to instill in a child the desire to be good.” In other words, they say when a child feels secure in his connection (attachment) to his mother and father, he will want to be good, and he will be a child who is easy to parent. “Cosleeping” and “bedsharing” (also referred to as “sharing sleep”) are terms often incorrectly used interchangeably to describe a sleep arrangement where family members sleep in the same bed. References to these words often lead to confusion about publicized information on safe versus unsafe infant sleep practices. Cosleeping, however, is an umbrella term that is used to refer to infants and their adult caregivers sleeping in “close proximity” though not necessarily in the same bed. Bedsharing, one form of cosleeping, is sharing the same bed with an infant. Unsafe infant sleep practices, including sleeping with an infant on a couch, recliner, or other non-bed surface, are not accepted forms of cosleeping or bedsharing. For safe sleep guidelines, read our Infant Sleep Safety resources. Can you balance everyday life and practice attachment parenting? 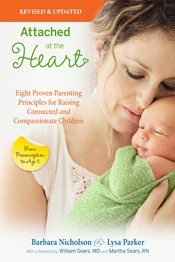 Balance permeates all of the eight principles of parenting. When there is balance, parents are better able to be emotionally available and responsive to their children and to others. In turn, family members feel more loving, more nurturing, and more supportive of each other. Why would “striving for balance” be a principle? Finding balance in your personal and family life often seems as allusive as finding happiness, but it needs to be a part of your everyday routine—a principle of life. It may help to know that, like happiness, balance isn’t an event but a journey that everyone struggles in on a daily basis. Balance requires focusing on nurturing all aspects of one’s self—physical, emotional, intellectual, and spiritual—although not necessarily all at the same time. One of the best ways to find relief and emotional regulation is by attending parent groups. API parent support groups have been successful because they provide the friendship, information sharing, problem solving, and empathic support that so many parents are seeking. Talking to other like-minded parents who have “been there” can provide a wealth of knowledge and relief through simple conversations..
William and Martha Sears emphasize that attachment parenting doesn’t mean that mothers must be anxious about their baby’s every move nor that they have to personally respond to the baby every time, but rather involve Dad as much as possible. Don’t strive for perfection, but do your best to be “good enough.” Attachment parenting will give you the gift of love, empathy, and connection that will last a lifetime. It will give you more confidence in yourself and in your ability to be not a perfect parent, but a good one.